I know store bought stock is not a great expense, but organic is $3 or more per carton and if you could get it for free, would you? Of course you would! Don’t be silly! 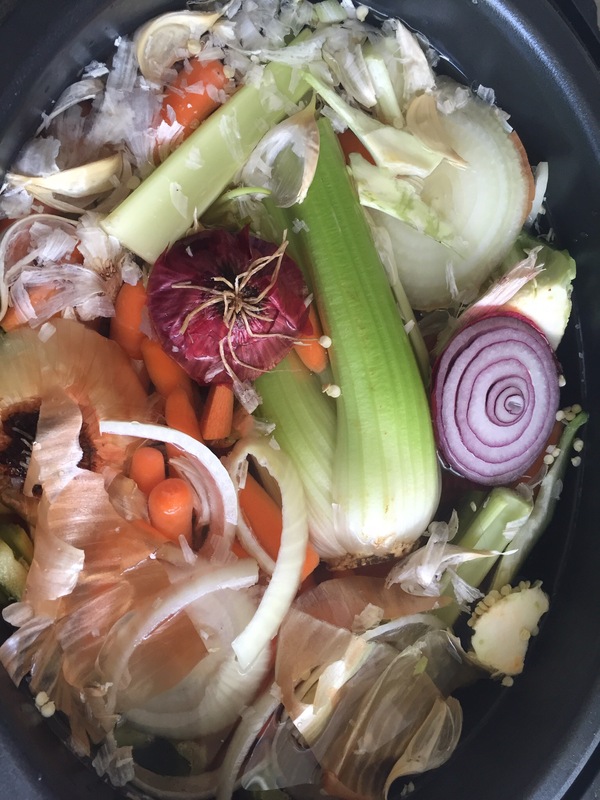 I want to share this super simple, waste not want not, easy peasy, save yo dollars vegetable broth. I started saving the bits of produce that I would normally toss… The ends of carrots and onions, the stem part of cabbage or lettuce, tops of bell peppers, ends of zucchini… You name it. Stay away from starchy items like potato skins etc. You don’t have to make a big production out of it, just keep a large ziploc in your freezer and add as you go. Once it’s full, dump it into your Crock-Pot, cover it with water, set it on low and walk away. I let mine go for 24 hours or more. If you don’t want to let it ride that long, try for a minimum of twelve hours. Once done, strain it, discard all of the solids and jar it up! Yep! That simple! You can freeze it in ice cube trays and store the cube in bags for easy use if you like. The broth will keep for a week in the fridge and for months in the freezer. No preservatives, no artificial colors or flavors, no msg, you control the sodium… Pure veggie goodness! I hope you will try this free and delicious alternative to store bought broth! Swearing Mom out. I never even thought of doing that. Thank you! It’s amazing what we can get from what would otherwise be garbage!